Instead of writing up a long review on some titles, I prefer just to give you a "quick" (I try for quick anyway!) idea of what books I've read that I liked and didn't like. Here are two Christmas titles I didn't feel like writing up a whole review on but that each deserved a mention - albeit for different reasons. Call Me Mrs. 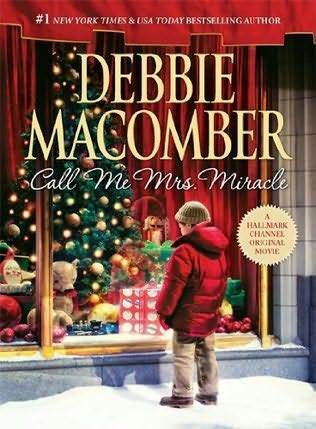 Miracle is the first Debbie Macomber book I've ever read. I've no doubt seen lots of her novels before, but wouldn't have paid attention to them because they are typically lumped near the "romance" section of bookstores and, quite frankly, I don't go to those sections when I'm looking for something to read. However, when I was hunting online for Christmas titles, Macomber's name kept popping up. I kept meaning to ask someone what their opinion was of her, but never got around to it. I ended up checking out Debbie Macomber's website and, finding nothing objectionable there, I went ahead and purchased a copy of Call Me Mrs. Miracle . I didn't realize that this book was her latest release. I didn't realize that there is another Mrs. Miracle book that came first (and was subsequently made into a Hallmark movie.) I picked up this particular new release based on the fact that I liked the Amazon.com synopsis of it. Yes, my friends, I took a risk. And just like the time I took a risk with The Mysterious Benedict Society, I ended up being glad of it. This won't be the last Debbie Macomber book I pick up and it was a perfectly delightful Christmas read. Her style reminds me of your typical Christian fiction (ok, admittedly, I don't find it all that brilliant but sometimes it's just fun anyway) and her style makes you feel all warm and cozy just like Jan Karon. I should point out that I can't say whether or not Macomber is a Christian but she certainly writes as one who understands a bit of theology and that was kinda evident in this book. Call Me Mrs. Miracle is Miracle on 34th Street meets It's a Wonderful Life meets joy and happiness during the Christmas season. Sprinkle in an angel unawares and you've got yourself a story that you'd enjoy seeing on film as well. Warm. Cozy. Pleasant. I sucked on peppermint candies and listened to Christmas music during this quick and enjoyable read. I enjoyed every moment. Not sure what to say about other Macomber titles but I can't imagine not liking her other Christmas books at the very least! 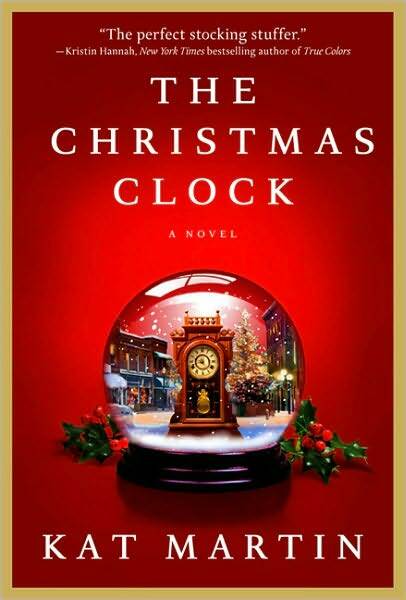 I picked up The Christmas Clock , by Kat Martin, based on reading the book flap description. 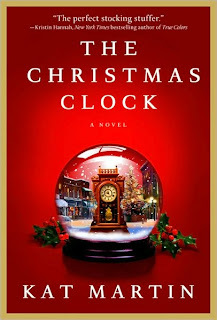 The idea is this: a young boy named Teddy wants to buy his grandmother, who is suffering from Alzheimer's, a clock that she admires for Christmas. His grandmother's wish is to find Teddy a home before she is incapable of caring for him any longer. Enter Sylvia and Joe - an estranged couple who separate due to lack of understanding. Teddy, predictably, presents a situation that ends up drawing the couple back together. It's a Christmas love story. Kat Martin's story is predictable, too short for any decent character development and presents the argument that grown ups can do whatever they like in or out of marriage and whatever they might choose to do should be good with anyone. If you really don't care about the sanctity of marriage or the sacredness of the marriage covenant, by all means go for this book. As for myself, Martin's message was too disturbing and it erased any message of Christmas goodwill and good cheer that I might otherwise have picked up on. I can safely assure you that I will not be picking up anymore Kat Martin books! I can't say that I make a regular habit out of picking out modern novels. (If you are a regular around here, you'll have noticed that.) In this case, I took a couple of gambles and feel like I won one, and lost the other. Not a bad percentage but I'm still working on forgetting The Christmas Clock. That's not really something I like saying about the books I read. I'm pretty sure that Debbie Macomber is a Christian. I've found that her non-fiction books are entertaining and light-hearted, although they do have adult topics and Christianity is not usually a major theme in the books. Her non-fiction books are more spiritually based. I have never read Debbie Macomber, but I see her name a lot amongst my bloggy friends, so I want to try her out one day. I am not a fan of Christmas stories in general -- they're usually too sappy and predictable. Thanks for the warning about the other book -- I am sure I would not like it, either. I always appreciate that when you don't like a book, you are able to tell us why in a very articulated way. Based on lots of reviews for Debbie Macomber...and the availability of them in audio form at the library, I saw one, and grabbed it. Though, from my understanding she is a Christian, the book I grabbed was a romance...and it was written for the romance market. Though I really LOVED the story line, I had to stop listening mid-scene, bc I wasn't certain where it was leading, but I thought I needed to stop, even if they didn't end up in bed together. Just a bit too hot and heavy for my liking. But as I said, I stopped...and it may have stopped too. I will never know. BUT I would definitely like to read one of her Christmas books since that won't be an issue. I found your blog during a search on L.M. Montgomery and have been following it ever since. I have been reading her journals based on your recommendation and it has been very interesting so thank you for that. I felt the need to comment on Debbie Macomber. I have read a few of her books and I do enjoy her easy writing style and the fact that many of her books are set in my beloved Pacific Northwest. I would hesitate to recomend any of her books to you, though, because many of them are written in the typical romance style and have some unnecessarily descriptive "romantic" scenes and some frustratingly immature romantic behavior between adults. I felt the need to warn you as I have gotten a sense of your reading style from your blog. Thanks for all the great book advice. Anon - THANKS! I'd respond to you via e-mail, but I can't. But I did want to say thank you because if you've followed me for awhile you WOULD know what I like and what I do not like. Annette - Good to know too. Seriously - thanks for sharing! I'm glad her Christmas one was safe but it's really good to know about her general style.